Having already competed at the 2.5-mile Daytana International Speedway and the 1-mile Phoenix International Raceway, the third race in the 2012 NASCAR Sprint Cup tour took the series regulars to a track in between the earlier two circuits. Hosting the Kobalt Tools 400, the 1.5-mile of Las Vegas Motor Speedway became the stage for another interesting round in a Sprint Cup where the front-runners are still inconclusive. Winning qualifying for the first time with his Hendrick Motorsports on Friday, Kasey Kahne placed the Farmer's Insurance #5 Chevrolet on the coveted pole. Kahne's 190.456-mile per hour lap average speed would be a record at the 1.5-mile oval. After some chaotic practice sessions, several top drivers would start the Kobalt Tools 400 fighting an even tougher battle. Losing their primary race cars, Jimmie Johnson and 2nd place qualifier Kyle Busch were required to start near the back of the 43-car field in accordance with NASCAR rules. Kyle Busch would receive aid prior to the green flag as several rear field cars allowed the #18 Toyota to start ahead oh them (An action permitted by NASCAR rules). At the front, as Busch was forced from his 2nd place spot, the start at Las Vegas Motor Speedway morphed into an all-Hendrick Motorsport front row with Dale Earnhardt Jr's #88 Chevrolet starting alongside Kasey Kahne. With the green flag falling for Sunday's Kobalt Tools 400, Kasey Kahne's time in the lead was over by the end of the second turn. 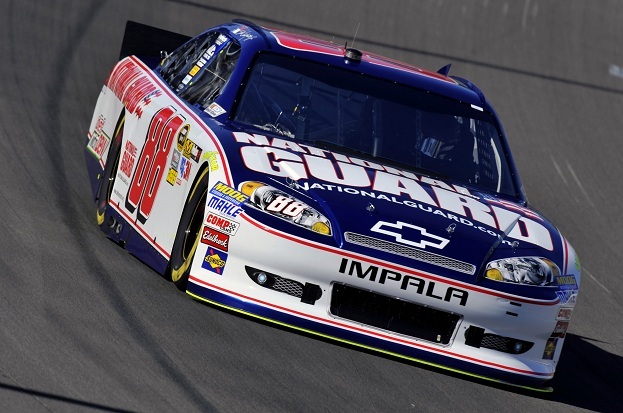 Showing speed early, Dale Earnhardt Jr surged in the lead at Las Vegas Motor Speedway. 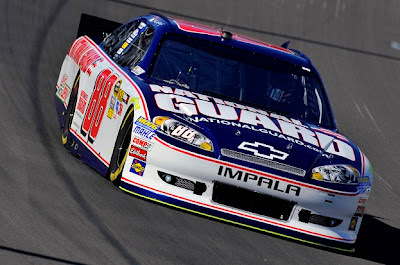 A sight so many JR Nation fans will want to see through this 2012 NASCAR Sprint Cup season, the #88 National Guard Chevrolet maintained a healthy lead on what was several challenger early on in the 400-mile event. With Kasey Kahne and Joey Logano holding the second place position early, Tony Stewart shot to second appearing to have enough speed to catch Earnhardt Jr. However, Stewart needed to back off from the fight as a piece of debris obstructed the grille of his #14 Chevrolet. Dale Earnhardt Jr remained at the front of the Kobalt Tools 400 for 70 of the race's first 73 laps even surviving a lap-46 caution coming out while pitting. The #88 Chevrolet would be knocked from the lead on lap 74 when several cars took two tires compared to Earnhardt Jr's team stopping for four. Dale Earnhardt Jr would be out of winning contention for the Las Vegas Motor Speedway event as the race progressed leading to a 10th place day for the #88 Hendrick Motorsports-owned Chevrolet. Kevin Harvick, Jimmie Johnson, Jeff Gordon and Tony Stewart would be some of the drivers leading the NASCAR Sprint Cup teams up to the halfway point of the Kobalt Tools 400. 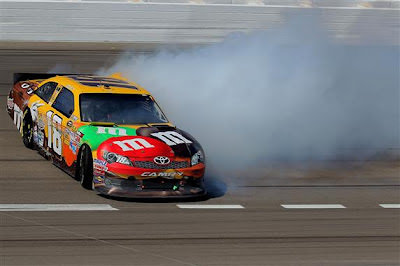 The Las Vegas Motor Speedway race was proving to be another hotly-contested round in the young 2012 NASCAR Sprint Cup year until a true dominator emerged supreme at lap 180. Having already led for 41 laps in the event, Tony Stewart and his #14 Chevrolet developed a liking for the first place spot that saw another 50 laps commanded by the Mobil 1/Home Depot-sponsored car. With all but 37 laps completed of the 267 scheduled lap distance at Las Vegas Motor Speedway, the race was slowed three times by the yellow flag. On 246, the #83 Toyota of Landon Cassill suffered an engine failure. With 10 laps to go, Kyle Busch would spin loose across the race track as he attempted to mount a strong top-10 finishing effort late. Spinning through the frontstretch, Busch was fortunate enough to guide the #18 Toyota safely through the infield grass. The second time this season Kyle Busch avoided a near certain wreck (the several saves during the Budweiser Shootout that later evolved to a win for the #18 Toyota), this time would not result in a best possible finish for the Joe Gibbs Racing driver. Kyle Busch would finish 23rd in what was a difficult Kobalt Tools 400 race. 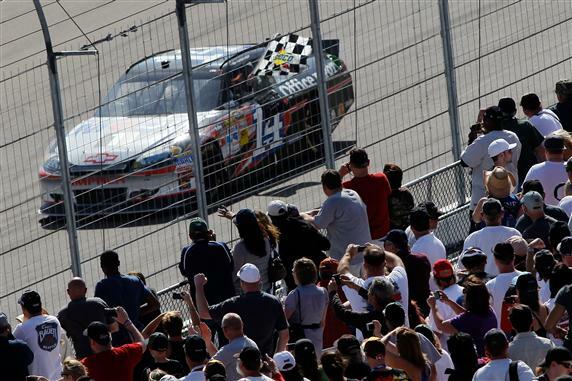 Despite a fierce challenge from a charging Jimmie Johnson (who flew from the back of the field to compete at the end for the Kobalt Tools 400), Tony Stewart lead 75 of the final 77 laps at Las Vegas Motor Speedway to win the event. Winning in the third race of the year, this season's first win for Tony Stewart was the earliest in his career. The Las Vegas victory was #14 car crew chief Steve Addington's first win since joining Stewart/Haas Racing. In the last NASCAR Sprint Cup event at Phoenix, Tony Stewart's former crew chief Darian Grubb found early success wrenching the #11 Joe Gibbs Racing Toyota and driver Denny Hamlin to the winner's circle. Jimmie Johnson finished second in a race where his race team and sponsor Lowes partnered in providing relief funding for the areas of the United States hard-hit by tornadoes two weeks ago. The finishes for Johnson at this early time in the NASCAR Sprint Cup series is playing pivotal to capturing lost ground from the Daytona penalty. Later this upcoming week, an review of the tech-inspection penalty that cost the driver and team 25 point following the disastrous Daytona 500 finish who also determine if crew chief Chad Knaus will have to serve a six-race suspension. In third in the finish in the Kobalt Tools 400 at Las Vegas Motor Speedway was the #16 Ford of Greg Biffle. Biffle prevailed best of a late-race battle between his Roush Fenway Racing teammates. On the last restart, a three-way fight among Matt Kenseth, Carl Edwards and Greg Biffle resulted in Kenseth losing out when he needed to slow to avoid contact. Kasey Kahne was also caught up in the calamity. Kahne would finish 19th and Matt Kenseth come across the start/finish line 23rd. Carl Edwards would finish in the top-5 with Greg Biffle who is currently the NASCAR Sprint Cup points leader in the 2012 driver standings. Other strong finishers at the Las Vegas race included Ryan Newman who backed-up his teammate/owner's victory with a 4th place, Clint Bowyer's finished 6th for Michael Waltrip Racing, Paul Menard with 7th in his Richard Childress Racing Chevrolet and a 9th place finish for Trevor Bayne driving the Wood Brothers Ford Fusion. For Bayne, this finish becomes his 2nd top-10 finish in the NASCAR Sprint Cup series (first being his 2011 Daytona 500 win). Next Sunday, the 2012 NASCAR Sprint Cup season turns to the tight 0.533-mile short track oval of Bristol Motor Speedway.